A lot of high end liquors try to sell you with a story. Martin Miller’s Gin has quite a doozy – after distillation, the raw spirit is shipped from England to Iceland to be combined with water to bring it to proof. I can tell you after receiving a sample bottle, and having enjoyed it in many fine establishments, that gimmick or not, Martin Miller has put his name on a fine gin. As the story goes, in 1999, British entrepreneur and bon viveur Martin Miller and two friends set out to create the finest gin possible, no expense spared. Their recipe, apparently formulation number 7, combines juniper, orange and lemon peel, coriander, licorice, cinnamon, cassia, nutmeg, angelica, and orris root. These botanicals are batch distilled in a century-old copper still in England’s Black Country before the aforementioned 3,000 mile round trip to Iceland. Martin Miller is making two gins; my sample bottle is of the 80 proof (40% ABV) version. On the nose, there is the slight scent of violet from the orris root, and a general pleasant spiciness. This plays through on the taste. I don’t find the citrus to be very strong, instead, there’s a confident bitterness from the juniper and licorice, along with a general interplay of all the spices. This gently eases into a balanced aftertaste that doesn’t linger. The mouthfeel is quite soft. Maybe there is something to that glacial Icelandic water. In preparation for this week’s TDN, which is sponsored by Martin Miller’s gin, I wanted to try a new drink. SeanMike of Scofflaw’s Den sent me a bottle of his take on Jamie Boudreau’s recipe for Amer Picon, so I thought I’d finally try the Fin de Siècle. 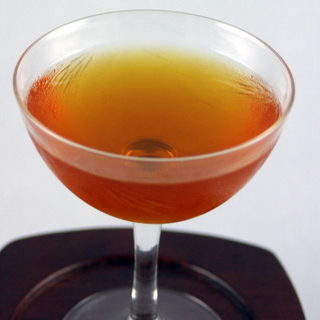 This cocktail was created in the 1920s, and refers to the19th century. Stir with ice in a mixing glass while dreaming of the 19th century, then strain into a cocktail glass. This is a nice balance of bitter and sweet, and I think it suits the Martin Miller’s well. This cocktail wouldn’t work as well with a more citrus-forward gin. I have not yet had a gin cocktail with MM that I didn’t enjoy. It makes a wonderful martini and gin and tonic. It’s an overall solid gin. Its list price is $33.99, which puts it in the same price range as other premium gins I enjoy. I can’t wait to try it. I used to live in Iceland and they have some of the best water in the world, it is fresh with a tangy clean flavor. It can only improve on the gin which sounds delicious with coriander, licorice, and orris root. Furthermore, the best licorice in the world comes from Iceland, so what better than a gin made with Icelandic spring water to have licorice root in it.